‘Paterson’ is directed by veteran director Jim Jarmusch. 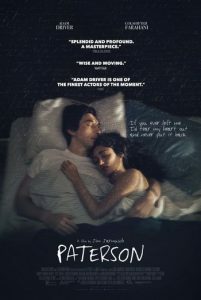 The main character Paterson is, by coincidence, a bus driver in the city of Paterson, New Jersey. Every day, he adheres to a simple routine. He drives his daily route, observing the city as it drifts across his windshield and overhearing fragments of conversation swirling around him; he writes poetry into a notebook; he walks his dog; he stops in a bar and drinks exactly one beer; he goes home to his wife, Laura. By contrast, Laura’s world is ever changing. New dreams come to her almost daily. Paterson loves Laura and she loves him. He supports her newfound ambitions; she champions his gift for poetry. The film quietly observes the triumphs and defeats of daily life, along with the poetry evident in its smallest details. It’s a fascinating and enthralling film that finds magic in the mundane. ‘Paterson’ will be screened on Friday 2nd March at the Jubilee Hall, Slade Road, Portishead. The film starts at 8.00pm (with refreshments available from 7.30) and tickets cost £5.00. All are most welcome.